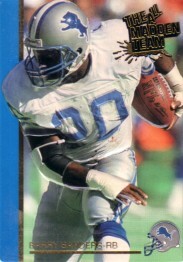 1992 Action Packed 1991 All-Madden Team card of Detroit Lions Hall of Fame running back Barry Sanders. NrMt-Mt or better. ONLY 4 AVAILABLE FOR SALE.